A "drop bolt" is a special centerbolt for a caliper brake, which is off-center to allow the brake caliper to reach farther down from the mounting hole than it is intended to. Drop bolts are commonly used when a bicycle is equipped with smaller diameter wheels than it was designed for, most often when substituting 622 mm (700C) wheels for 630 mm (27 inch) wheels. Can You Get a Drop Bolt to Solve Your Problem? Drop bolts used to be available for traditional single-pivot side-pull brakes, of the type which use two nuts to secure the arms to the bolts. Unfortunately, these are now pretty much extinct. Drop bolts are not available for single-pivot side-pull brakes that use a centerbolt with a fixed head, such as all Shimano models. 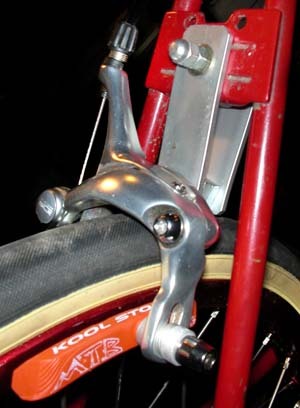 Drop bolts used to be available for dual-pivot sidepull caliper brakes. They no longer are, but we are keeping information available on how to install them.Click here for details. I have made home-made drop bolt replacements from aluminum stock or even reflector brackets. For example, a reflector bracket has two holes for the reflector. Cut off the flat part the reflector mounts to, with its two holes. You need two of these, one in front of the fork crown/seatstay bridge, the other behind it. One set of holes is secured to the brake bridge/fork crown with a 6 mm or 1/4" bolt. The center bolt of the caliper goes through the other set of holes, with a stack of washers between the flat pieces of reflector bracket. You may have a problem if the center bolt isn't long enough. A more elegant variation on this is to use aluminum stock from the hardware store. I usually use 3/4" x 1/8" stock. Space the holes so that the brake shoes wind up near the top of their adjusting slots, this gives better braking. To the right you can see the rig on one of my Raleigh Twentys, using a short (39-49 mm) reach Shimano caliper on a bike that originally needed a 100 mm reach caliper. I used some oversized square nuts I had hanging around as spacer washers. The caliper I used was intended for "recessed" front mounting, and the center bolt wasn't as long as I would have liked, so the front and back aluminum strips are not parallel, but this is still sturdy enough, and gives super braking. John Allen has another example. He placed the drop bolt entirely behind the flat Pletscher plate of his Twenty, so the fender could be mounted to the tab at the bottom of the plate. This system is a bit funny looking, but it works extremely well. I have never done it on a customer's bike, but several of my personal bikes are set up this way.